Healing Whiskers: Therapy Animal Workshop & a Trunk or Treat! 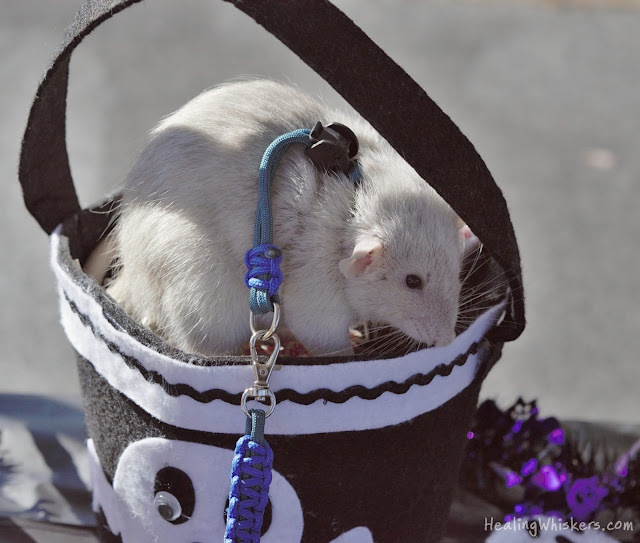 Therapy Animal Workshop & a Trunk or Treat! So a lot has happened in the past few weeks! Last week I completed the Pet Partners Therapy Animal Handler Workshop and just today I went to a Trunk or Treat with my fellow Compassionate Paws therapy teams. 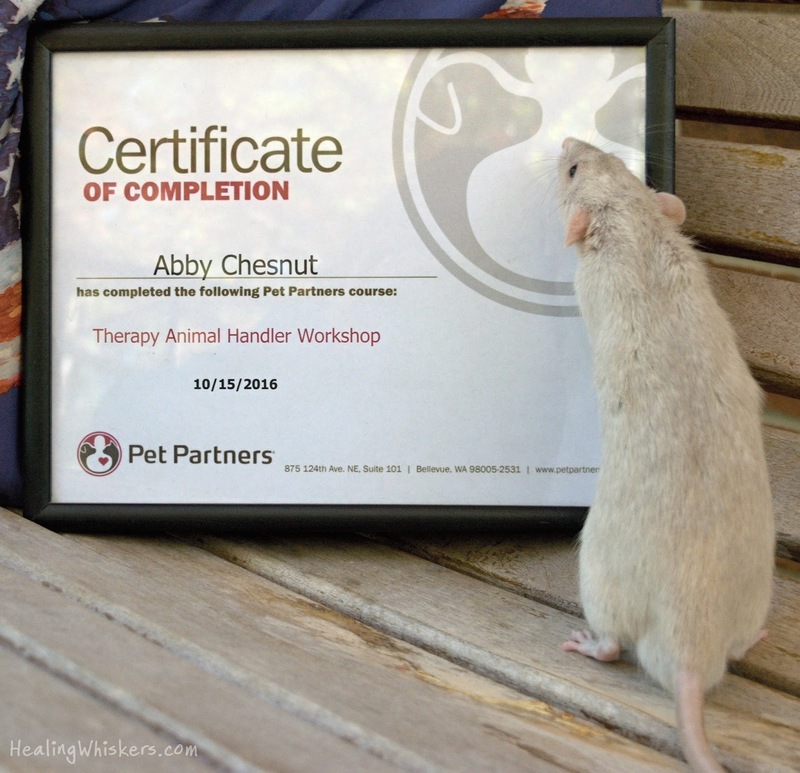 So to be a registered therapy team you first have to take a course. 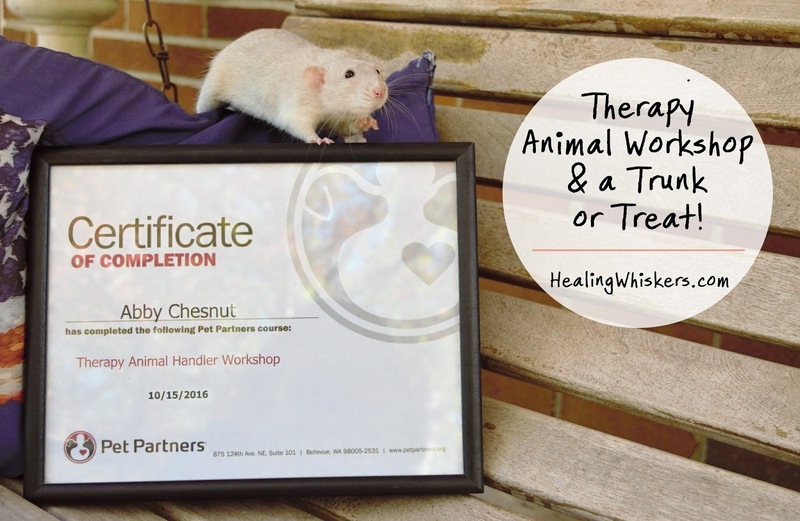 This can be online or in person and covers a wide variety of subjects like recognizing when your pet is stressed, equipment, and even contains little skits where you practice talking to and/or confronting people in different therapy situations. I learned so much thanks to my instructor, Laurie Angel! 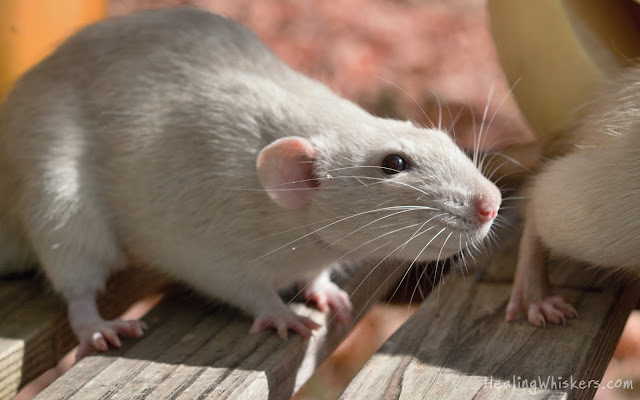 I wrote a lot of notes and will compose lists on what to look for in a therapy rat, equipment needed, stress signals for rats, training needed, and such like that. We will be evaluating with Pet Partners the next go around which should be in December! Since it is finally cooler and Halloween is a when a lot of events happen, we are getting out there to get Oliver the experience and socialization he needs. Our therapy group, Compassionate Paws, was part of a trunk or treat at a local church so we tagged along. Oliver has had a couple of experiences with kids, but not a lot, so this was my main goal for the event. "This candy belongs to me now!" He did wonderfully! 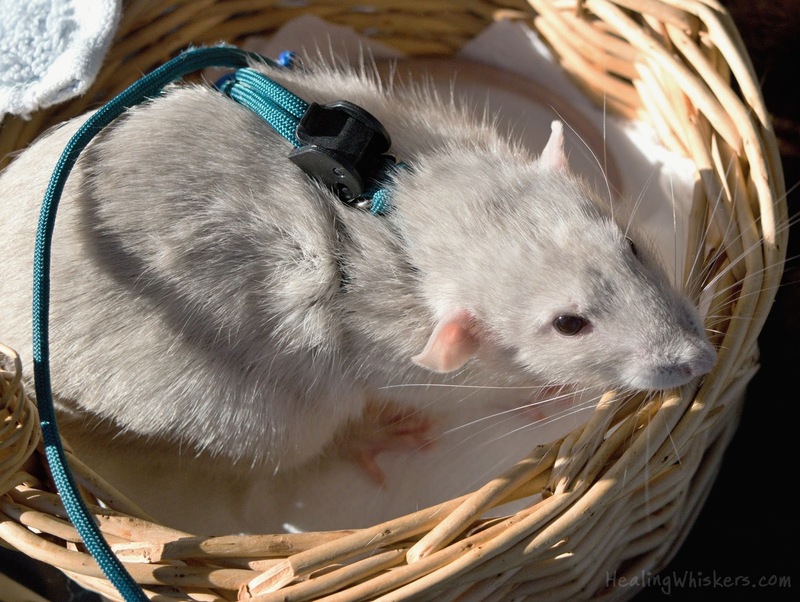 We just got a new harness and leash set from The Rat Guru which works really well and we had a ton of kids come by and pet Oliver. At one point there were maybe 4 or 5 kids at one time petting him, haha! He took it like a champ and we even had a visually disabled child smile as he pet the super soft rattie. One mother told her boy that Oliver was gonna help people and he wanted to ask me a question. He came up to me and asked, "Can he help me with my reading?". While my heart was exploding, I told him I believe he could. That got me thinking about the reading program Pet Partners does as well. If you have ever seen a video of a kid reading to a dog this would be the same...but with a rat. I talked to my colleagues afterward and they said for the reading program he would just need to be good at being calm and staying still. I think we could do that! So what is coming up for Oliver is a couple more events with working on staying in his basket and still refining his potty training skills. By the next Therapy Animal evaluation in December we should be good to go! If you were a little kid, would you like reading out loud to a rat? 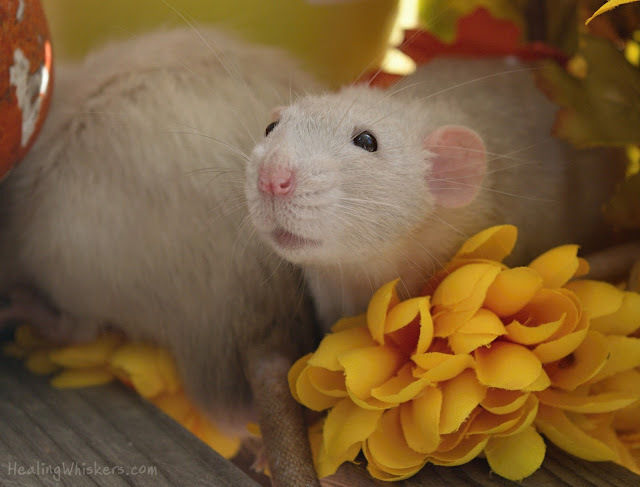 I would have loved a reading buddy rat as a child! I have a question about Pet Partners, though. Around here we have multiple small pet therapy organizations running various visits and I was looking into joining therapy dogs international, but they require you only work with their organization! Does pet partners allow you to continue working with other groups? I'm not sure, but I think so!